Ribs have always been a passion for Sam Platt. Those who had the opportunity to enjoy his ribs or barbeque at a company picnic or family gathering would often encourage the former restaurant manager to open his own place. When a friend mentioned that the original owners of Honky Tonk Pig Smokehouse were retiring and wanted to sell, Sam and his wife Susan decided that this might be the right time to make it happen. After a quick family meeting, their four kids and even their parents loved the idea and all were on board to help staff and grow the small eatery with a big reputation. 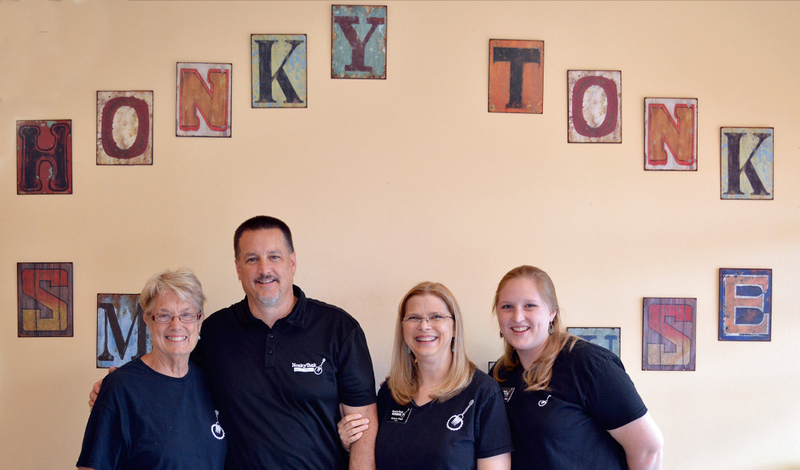 Sam and Susan bought the take-out restaurant in June 2013. They dropped “Pig” from the name to promote Honky Tonk as an equal opportunity eatery, serving beef brisket, pork barbeque, baby back ribs, chicken, turkey breast and smoked sausage. Continuing the Honky Tonk tradition, Sam hand-rubs the meats with special spice blends, lets them rest a day, and slow-cooks them over a hickory fire until they are “fall-off-the-bone” tender and delicious. Honky Tonk Smokehouse serves meats that are hand-pulled or sliced, not finely chopped, with a special barbeque sauce served on the side so the customer is in control of the taste. They also offer chicken wings, Brunswick stew and a slew of sides and desserts, all made to order in the restaurant to complete your meal. Since the meats are prepared overnight, the restaurant sometimes runs out of popular items on a busy day. They encourage you to call ahead to place your order and it will be ready and waiting for your arrival. Honky Tonk Smokehouse added a 60-seat dining room in late 2015 and is excited to get to know their customers better when eating in. On weeknights, they can host small groups in the back half of the dining room. When possible, please call ahead to reserve their eight-person round table or to join other tables together for your group. Although HTS is happy to provide lunch or dinner to a single customer, a large part of their business comes from providing meals for events such as company luncheons, backyard parties, tailgating, family reunions, civic events and wedding receptions. In addition to the option of take-out, they can provide delivery and serving at your location for special events. They will work with you to develop the combination of food and services that works for your needs and your budget. They also have joined up with DiningDash and Takeout Central to deliver to their hungry but busy customers in a home or small office setting. We are pleased to offer a large portion of gluten-free items on our menu including all of our sauces, most of our meats, and some sides. These items are clearly marked on our menu page, but if you have any questions, don't hesitate to ask. You can also view our Allergens List PDF for further clarification. Honky Tonk Smokehouse cares about our customers and our environment. Although we use Styrofoam packaging to maintain product quality for take-out, we use unbleached paper plates and food trays that are readily biodegradable for dining-in. We also continue to use environmentally-friendly cleaning supplies. We hope that you agree that it's important to take steps to reduce our impact on Mother Earth. Honky Tonk Smokehouse wants to be a good citizen in our community and the world. In the past year, we have contributed to many places. Click here to view how we have been helping out.